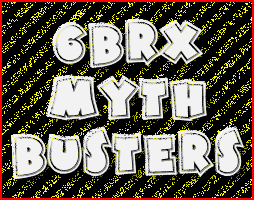 After Accurate Shooter published the July 31, 2010 Daily Bulletin feature on 6mm BRX Myth-Busting With Bob Crone, further research reveals that there’s more to tell about the BRX, its origins, and its original specifications. I wanted to obtain a print reflecting the true original dimensions of Bob Crone’s 6mm BRX reamer. I hoped to verify the head spacing of the reamer to be .100″ longer than a 6mm BR, and I also wanted to see how Bob’s original print compares to 6mm BRX match reamers currently considered to be the “standard in the industry”. 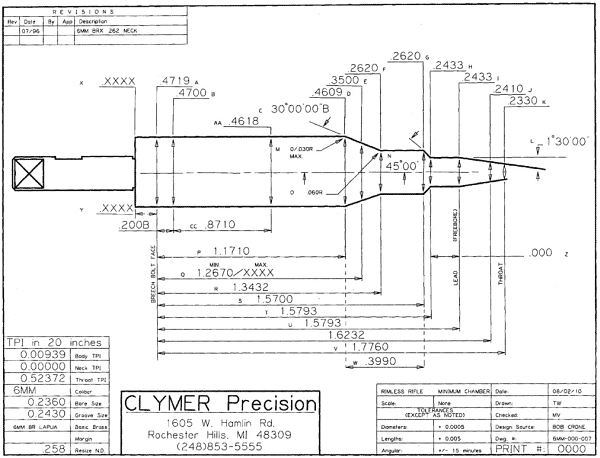 Clymer Precision was contacted to obtain a print of Bob’s original reamer. Todd Wilms, the current owner of Clymer Precision (and a heck of a nice guy as well) went back in the Clymer archives and pulled the records of the dimensions of Bob Crone’s 6mm BRX reamer. Todd then entered them into Clymer’s current reamer drawing program and has generated a current drawing reflecting the original 6mm BRX reamer. The print (see below) confirms the head space of the 6mm BRX to be .100″ longer than a 6mm BR (i.e. 1.267″ min at a shoulder datum diameter of .350″). A. Body Diameter: A chamber body diameter of .470″ is still in wide use today with 6mm BRX reamers (that’s measured .200″ forward of the bolt face). The current Lapua 6mm BR brass has a web diameter very close to this diameter and one should be wary of trying to tighten this dimension. If anything, running a little looser (like the .4708″ dimension similar to that used with the 6mm Dasher) would not hurt the performance of the 6mm BRX cartridge a bit. B. Shoulder Diameter: Bob’s original reamer had a shoulder diameter of .4609″ (the same as a 6mm BR Norma), however many current 6mm BRX reamers now use a .460″ shoulder diameter which helps avoid overworking the brass there if readily available commercial dies are used. C. Max Chamber Length: Bob’s original print had a “max chamber length” of 1.570″ (the same as a 6mm BR Norma), however many of the current 6mm BRX reamers have shortened this up a little. This is because, when 6mm BR brass is fire-formed into 6mm BRX brass, typically the brass shortens. Indeed, this author’s 6mm BR brass shrinks in OAL from around 1.555″ to around 1.547″ when it is fire-formed to 6mm BRX brass. A max chamber length in the range of 1.560″ – 1.565″ is seen often with 6mm BRX reamers these days. D. Neck Diameter: While Bob’s reamer has a .262″ neck, this has for the most part given way to either a .269″ (sometimes .268″) turned neck, or a .272″ (sometimes .271″) no-turn neck, with the neck diameter typically selected based on the actual dimensions of the brass to be used. E. Throat Angle: Bob’s throat angle was one and a half degrees, which seems to be standard and in wide use today with the 6mm BRX. F. Freebore: Bob’s freebore length was 0.00″ because his smith used a separate throater to set the throat length Bob wanted for specific bullets. These days, a built-in freebore in the range of .104″ – .125″ seems to be very common with 6mm BRX reamers. Freebore in that range is seen by many as a good choice for the readily available 105- to 108-grain 6mm bullets. Here are measurements on Robert Whitley’s 6mm BRX brass, as fire-formed, full-length sized and ready to load in a no-turn chamber. Share the post "Myth Busters II – Bob Crone’s 6mm BRX – by Robert Whitley"